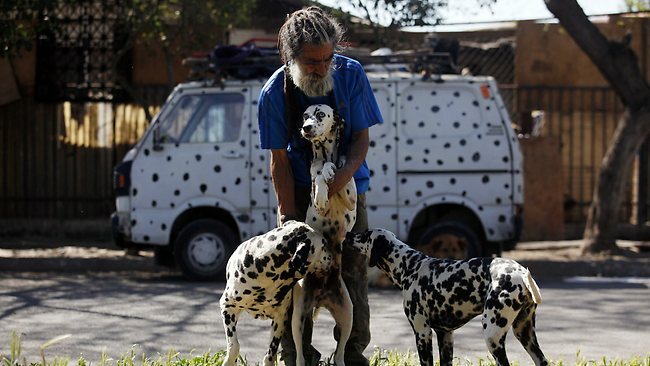 Here is Nestor Vergara, 55, known to many people as the “Dalmatian Man,” pets a couple of his 42 dogs in front of his home in Padre Hurtado, a town on the outskirts of Santiago, Chile. After watching the 1996 Disney movie 101 Dalmatians, Nelson Vergara began fantasizing about rescuing and taking care of as many dogs as possible. That has him trouble with the authorities. His neighbors constantly complain about the foul smell coming from his yard, and municipal officials have threatened to evict him by the end of the month.Mr Vergara says he only wants to set an example and raise consciousness so other Chileans can help in saving the growing number of stray dogs. Free-roaming dogs number in the millions in Chile, a situation the country’s Humane Society has called alarming. Dog owners rarely spay or neuter their pets, and commonly leave them outside when they go to work. Many dogs roam the streets all day. Source: AP. The Dalmatian is a breed of dog whose roots trace back to Croatia, where the first illustrations of the dog have been found. The Dalmatian is noted for its unique black or liver spotted coat and was mainly used as a carriage dog in its early days. Those who lack the ability to settle in life have been known to prefer and go jail. Just that their need for shelter and basic need of food is provided in the jail. Many example can be sited and noted even in the advanced countries of the west. They learn a skill or even complete their studies to earn certificate and credits for the degrees. Here under an example is given for Lance Brown from Columbus, Ga.
Lance Brown was hungry and homeless, so he decided to get thrown in jail by hurling a brick through a glass door at the Columbus courthouse building. Brown, 36, spent nine months in jail before his April trial. On Tuesday, he was sentenced to another month behind bars, and three years of probation that includes a six-month stay in a halfway house.